I’m on a train. I’m currently pondering the legalities of punching a young man in the spleen. My only defence is that he seems like an arse. He’s just answered the phone with the words “yes bro” and has regaled us all with a tale of how he ended up in bed with a young lady who he’s met 3 times but the first two of these she was working in Tesco. You’ll be relieved to know that he fell asleep on her head. He’s now giddy at the prospect of another female friend holding an Ann Summers’ party. I hate to disillusion him about the “15 horny girls” he’s expecting there. Anyway. I’m on a train because Ginge and I have had a day off together and have ventured off to Lancaster for the day. I love Lancaster. It’s a smallish university city in a quite old fashioned way. There’s a healthy mix of free range vegan yoghurt knitting (the best business card I spotted was advertising a practitioner of ‘hypnobirth’. Yes. Hypnobirth, I’ll just leave that one hanging there shall I? ), proper academic types and middle class socialist workers as well as everybody else. The academic bias makes for a lot of students, which depending on your point of view can be either a good or bad thing. Personally, I enjoy spotting the plethora of university society hoodies (although today’s favourite marked its owner as an participant of Ultimate Frisbee, which I’m sure doesn’t warrant crested leisure wear) and may make my own I-spy book for our next visit. If you’re ever up in Lancaster, you’re spoilt for choice with where to eat. We lunched at Soupanova, which opened when I was a student and provided me with most of my soup ideas at that time (without them I never would have made half the varieties that I have cobbled together over the years, but in particular I have to thank them for cauliflower and butterbean). Today Ginge indulged in onion, leek and blue cheese and I had ham and mushroom soup with a hunk of poppy seed bread and butter. 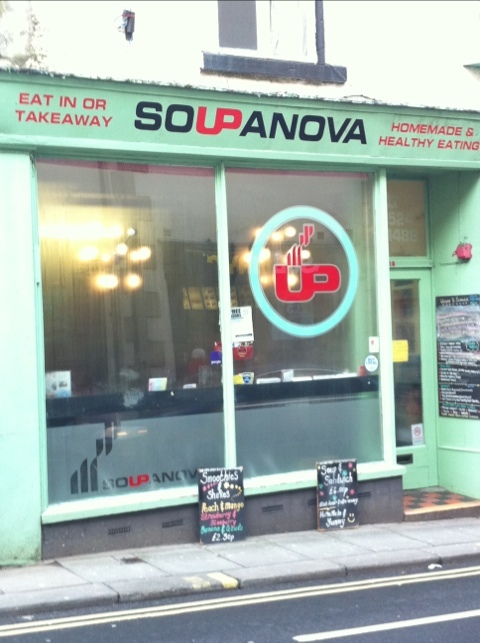 I am always happy when I return to Lancaster and see that Soupanova is still going strong, it really does deserve to. The main reason for us heading north for the afternoon was to restock the beverage cupboard. Ginge is a late arrival to the world of coffee, but has progressed rapidly to exploring the world of coffee producers and grinding his own beans, which are now drunk black and sugarless. As such, we make a regular visit to Atkinsons, the home of the best coffee in the North West, if not much, much further afield. It’s a bloody marvellous place – especially if you go on a roasting day when the scent of freshly roasted beans wafts down China Street. On a cold day like today, it was lovely to sidle up to the stove while Ginge sorted out his purchases. Personally, I am a resolute tea drinker and was more than happy to leave with a big bag of pure Assam and a smaller bag of ginger tea to see me through the rest until spring when I will restart on the Blue Sky blend. Some of Atkinson's finest. 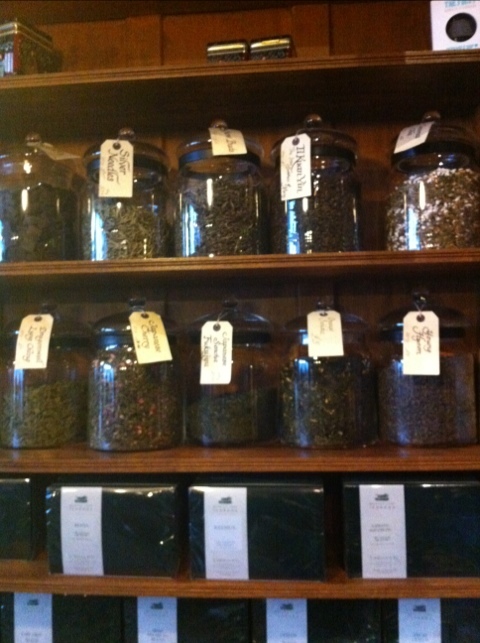 I was too shy to take a photo of the gorgeous old jars behind the counter. It was then on to the Robert Gillow, a pub that we’ve passed many times but never been in, for a spot of pub knitting, a Lancaster blonde in The Sun and tea (and pint of Doom Bar) in the White Cross. Unfortunately, it was then pointed out that Lancaster appears to close its borders at nine so rather than risk a ten hour journey home (I presume that a lot of that would be spent lurking on Preston station), we went for the half eight train. At the station we learned that beverages were not provided after seven and so despite a shared urge for cake, we were left circling the vending machines (mint Aero – good, Caramac – work of the devil, raisin and biscuit Yorkie – given to a sad crying girl who looked absolutely heartbroken) until the train came and I developed an irrational hatred of the bouffant young man sat behind us. 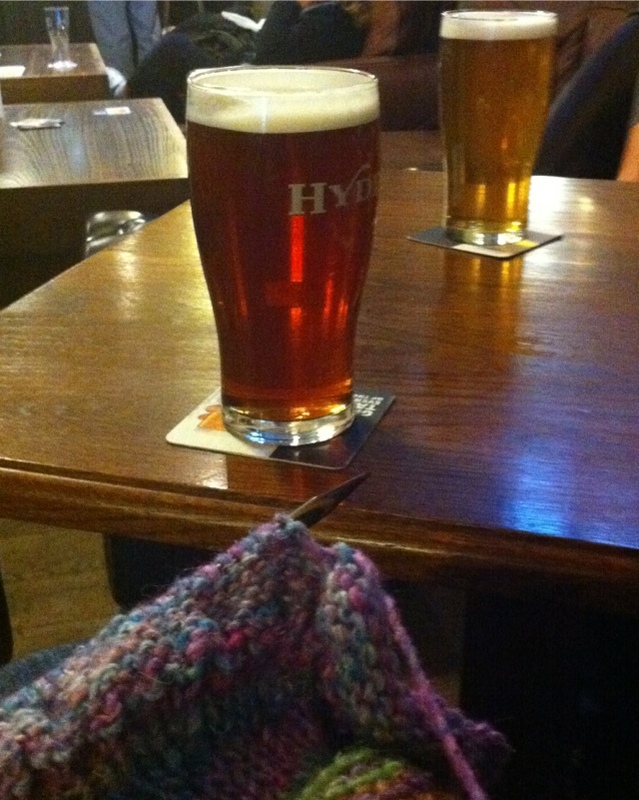 Beer, knitting. Knitting, beer. My idea of utter contentment. Oh, and to enable all this to happen without too much of the day being taken up with Janathon, I raced Miles again. The outcome was poor. In fact the outcome was worse than last week, but I will point out that Miles doesn’t have headwinds and overenthusiastic morning bowels to deal with. I swear I’ll get him one day. Miles shows off his wind AND waterproof case and satellite docking station. I think I should take up knitting again. Sitting in a pub passing a few leisurely hours knitting sounds really good. Like the tour of Lancaster, where next? 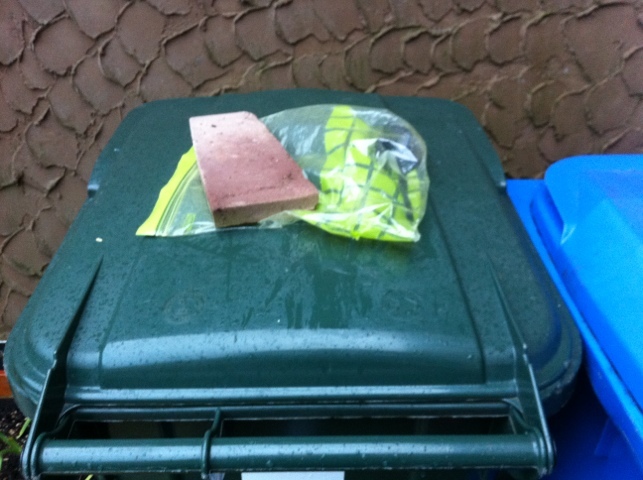 The bin-satellite-acquiring photo is just ace! How did you not knee the phone-answering knob in the, erm, knob? He sounds like he needs it. And hypnobirthing, I am guessing, is probably all the rage around these parts. I do believe your heightened relaxed state allows the partner to indulge more in gas and air fun, so is positively encouraged by ‘birthing partners’. Ahem. Well done – sounds like you had a fantastic day – apart from the bloke on the train! love the name of the soup place! what are you knitting?